Today the group split up – half taking a “walk” (more like a hike) through a rice paddy. The rest of us went to Sanggingan, not far from Ubud, to do silk painting with two wonderful silk painting artists: Aguso and Renee. We got to see a collection of their works – predominantly used for making silk garments and scarves as well as wall hangings. The process begins with a drawing on parchment which gets transferred to a length of silk charmeuse. Next the silk is stretched and pinned to a frame so a fine line of beeswax can be applied. The process is the same as that used for doing pysanky – Ukrainian Easter eggs – applying a fine line of heated beeswax with a stylus. The wax protects the base colour of the fabric from the dyes that are applied, in this case, using a “brush” (a 8″ length of wood with a tip that looks like an overgrown Q-tip). We were given silk squares which had already been waxed (although we did get to try our hand to applying it ourselves – it felt very like doing pysanky and my control of the stylus quickly improved as I used it). We were shown how to apply the dye, then turned lose on our prepared design. I had selected an image of a Strelitzia (bird of paradise flower). The challenge when applying the dyes is to do it in such a way that you get subtle shadings – much more difficult than it at first appears. Dyes get shaded with the help of a bit of water carefully applied to move one dye into the next while both are still wet, not unlike the way colour is blended in a watercolour painting. We had a limited number of brushes to work with, none really small enough to apply the dye in small spaces so it was inevitable that dye did occasionally end up outside the waxed outline. Nevertheless, in a couple of hours I had a finished flower. Applying the background colour also required learning about how the silk absorbed the dye when enough was applied – I didn’t need to bring the brush right up to the waxed line – if enough dye was applied it travelled to the wax line but no further. We didn’t do this ourselves, but the pieces are finished by being dipped in some goop to fix the dye, rinsed thoroughly, placed in boiling water, swished around until the wax outline is completely melted, then hung to dry. Our pieces will be finished and delivered to us by the end of the week. I still have all my supplies for doing pysanky. I must dig them out when I get home and see what I can create. The ones above are of a building we passed on the way to Ubud. Very Balinese. The trip took about an hour although the distance isn’t great. We were in a small van so greatly affected by the traffic. As we got further and further from Denpasar, the roads got narrower and narrower. We passed through a number of small communities although the demarcations were blurry. What was striking is that Bali is a land of crafts people: we passed many woodworking establishments (you could tell by the milled lumber outside); ceramic pots were being made in lots of different places, many businesses selling statuary of Hindu gods, some obviously old, others contemporary. We haven’t walked around Ubud much yet but one thing is obvious – the sidewalks here are accidents waiting to happen. I’ll take pix tomorrow so you can see – you have to walk with your eyes on your feet to be sure you don’t trip over broken tiles, or fall into a drainage hole! And the sidewalks are narrow with traffic very close at hand – you have to be watchful. I could write about the food as well, but that has to wait for another time. I have to go in before the mosquitos get me even though I’m wearing quite a bit of DEET – they’re flying around me. A door to one of the rooms in the hotel we are staying at. 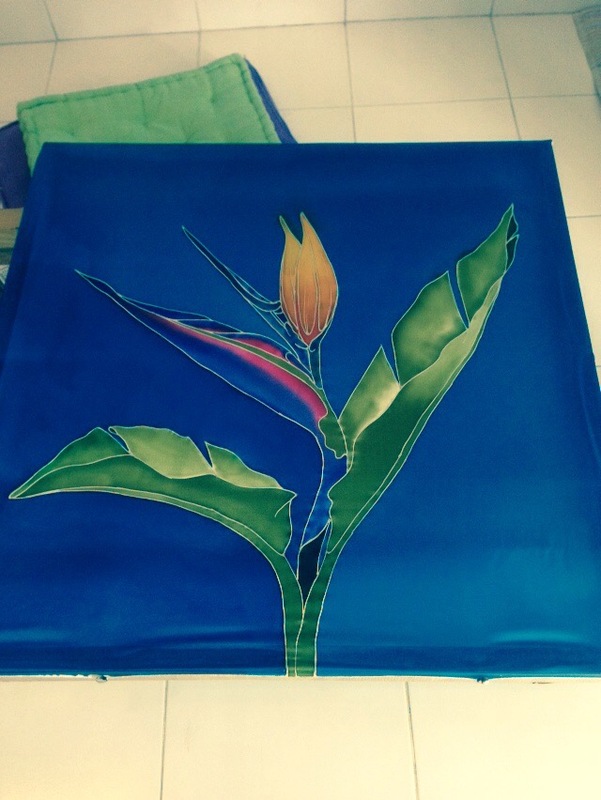 More tomorrow – silk painting! Can’t upload pix again today-no idea why. I’ve tried several possibilities but can’t get any of them to work. I believe it has something to do with me not enabling international roaming. So I’ll carry on with describing my experience. 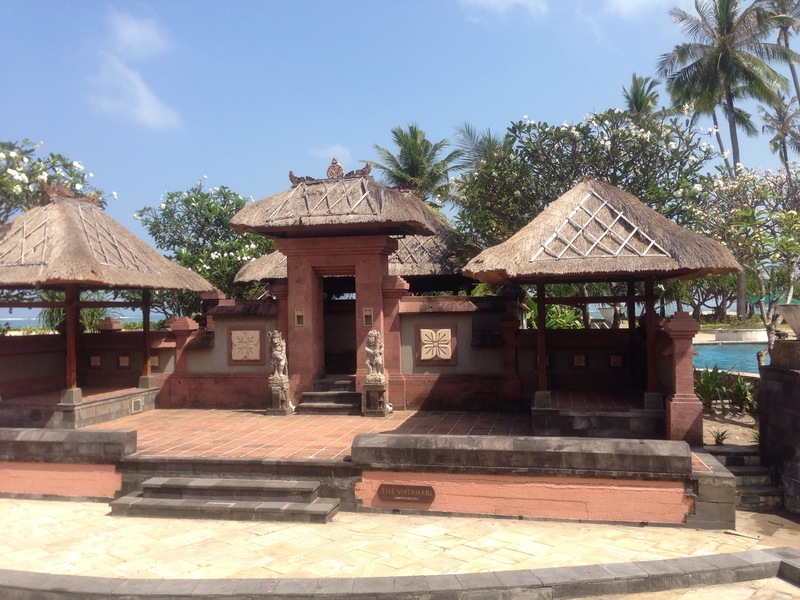 The grounds of the Patra Jasa Bali Resort are wonderful – you see gardeners cleaning up fallen leaves daily, pruning shrubs, attending to the clothing of some of the statues (they put sarongs either in black/white check or in a golden yellow on statues of what I believe are God images, rethatching some of the roofs/rooves. There is bougainvillea everywhere in shades of white, peach/red, pink and purple; sometimes more than one colour on a single plant obviously the result of grafting. Lots of frangipani trees on the grounds. 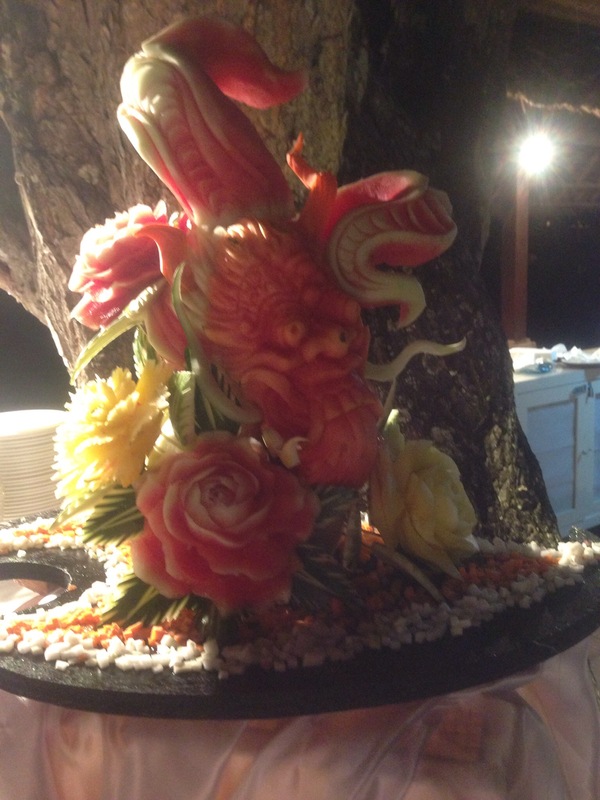 Heliconia, hibiscus, and a purple flour I don’t recognize. Cana lilies, and various kinds of palms. Kalenchoe which we get as a small potted tropical plant, grows shrub size here. I stopped to take pictures on my way to breakfast this morning – too bad I can’t include a couple. Following breakfast, I led a water aerobic class with three of the gals in our group-it was at their request. Following the exercise the group got organized to go shopping. Here’s the contrast again, we went to a LARGE shopping centre. This time both cabs reached our destination. We specifically went to a department store selling all sorts of goods made from batik. From tablecloths to men’s, women’s and children’s clothing. I could have binged on gift buying, but nobody needs more stuff so I bought next to nothing. The only thing I picked up was a gizmo with two holes used for tying a women’s sarong. The mall was large and filled with shoppers. After an hour and a half of looking around the shops we went for lunch – to Pizza Hut – very contemporary Bali. Again, traffic was astounding – it’s a free for all – the motorbikers seem to ignore any rules of the road and swoop down on the cars. We made it back to the hotel by mid afternoon – at which time I crashed – slept for an hour and a half before a group dinner which turned out to be good food and pleasant company. 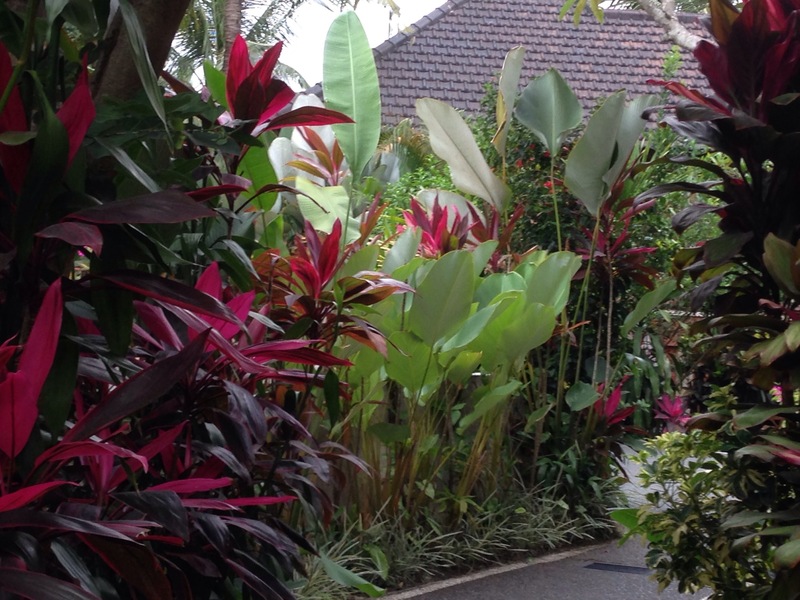 Tomorrow we change hotels – we’re heading to Ubud and the artistic community and rice paddies. Should be interesting. The trip begins in earnest. I’ve tried and tried but can’t get photos to upload! (It’s the slow wi-fi connection that’s the problem.) I’ve tried on my iPhone and on my iPad. No luck on either device. But I want to record my impressions – so here goes without benefit of images. This morning after a lavish breakfast buffet, I walked to the pool and the beach just beyond. Its what you’d imagine Bali to be – lovely sunshine on a sandy beach with waves lapping the shore and breakers in the distance, great for surfing. 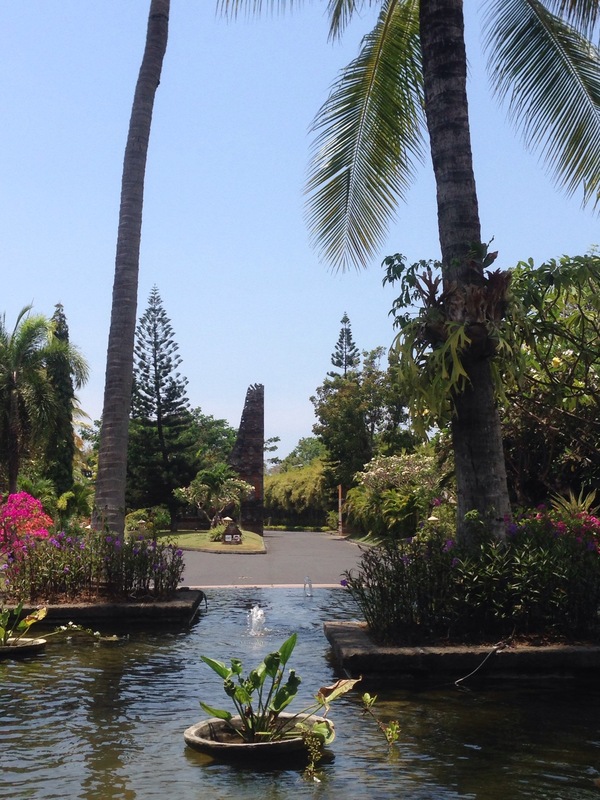 The pool and the grounds with lush tropical foliage (both trees and gardens) typical of a South Pacific island setting. 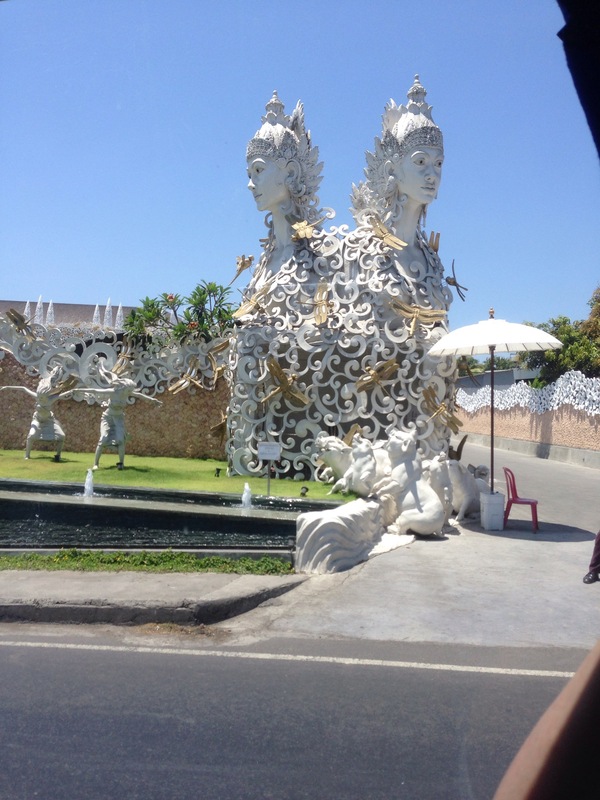 Early this afternoon we went by taxi into Kuta – a gazillion motor bikes weaving in and out of the dense traffic narrowly being missed by the cars – some carrying cargo, some with passengers, all traveling at high speed. I’m a courageous driver but you couldn’t pay me to drive here! Then there are the streets lined with small shops – their owners persistently trying to entice us into their particular establishment. We were in two groups – we had planned to meet at Tommy’s Cafe. Our taxi driver had no clue where the cafe was located. He dropped us off at least two kilometers from our destination! Cheryl our guide didn’t have the actual address with her; the four of us stopped frequently to ask directions – nobody knew what we were looking for. Finally Cheryl phoned her Balinese friend, had her explain how to find Tommy’s to a shop owner who had never heard of the place. Cheryl did this twice more before we were able to see the Cafe sign in the distance. Once there, four very hot and tired women were in need of what was billed as the “best iced coffee in Bali”. I have to say, not being a coffee drinker, that the milkshake consistency drink hit the spot. 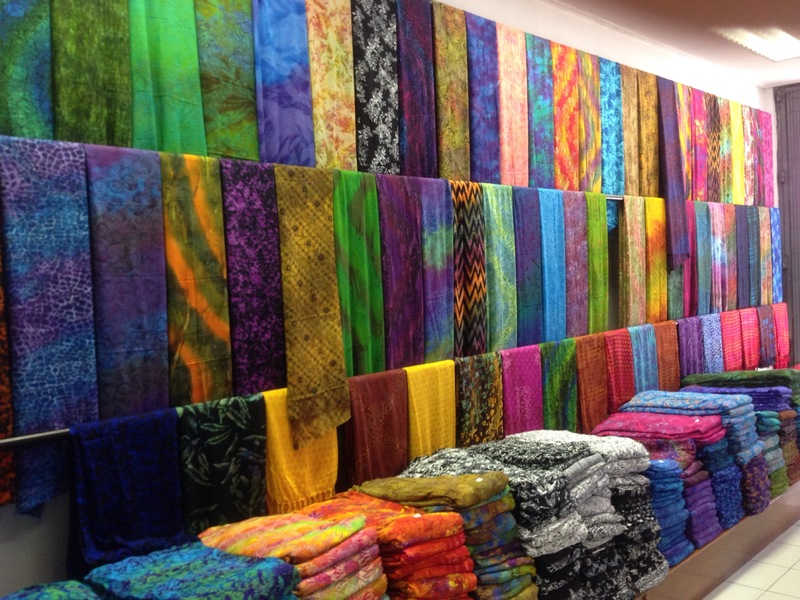 After lunch at Tommy’s, we went a few doors down the street to shop for rayon batik fabric. A wonderful, colorful selection. It was frantic in the small shop as each of us made selections, had the fabric cut to length, wrapped and paid for it. Great fun! I ended up with 2 1/2 yds of a deep teal with a lighter design in shades of pale blue – it should be enough for a dress or loose shirt. We returned to the resort in rush hour traffic. If we thought traffic has been bad earlier, it was simply hair-raising on the return trip. I bet though all those people made it to their destination. It was still hot so a number of us went to the pool for a relaxing dunk! That followed by dinner – I ended up at the Japanese restaurant in the hotel with two other of the gals (both from the Boston area). The rest ended up at the pizza place in the hotel. The amazing thing is all flights were on time – the flight from Bangkok actually arrived in Denpasar a wee bit early. Made it through visa and immigration without terribly long line-ups. Finding my luggage was a bit of a challenge – the baggage carousels aren’t well marked. But eventually I did find my large bag. 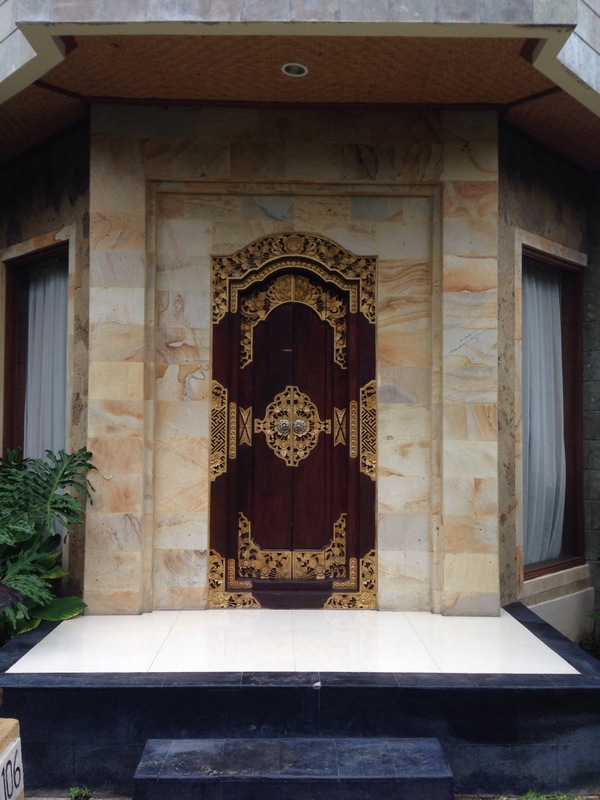 Got a taxi without any fuss and arrived at the Patra Jasa Bali Resort which is about an eight minute drive from the airport. The resort has been around a while, but it’s still reasonably elegant. My room is pleasant but with some serious hums – it took some playing with light switches to finally be able to turn off the loud rattling fan in the bathroom and still keep the wall sockets active so I can charge my iPhone and iPad. Not long after I arrived I was able to track down the other four gals who were arriving yesterday. After unpacking and a quick shower, we had a golf cart come pick us up (the grounds are huge – have no idea where our rooms are in relation to the lobby – you call for a cart to come pick you up – today, I expect we’ll actually walk at least once) take us to the Italian restaurant that was actually opening that evening. Then I simply crashed! I just wanted to put my head on the table and pass out. We were all tired so we rather quickly got a golf cart to take us back to our rooms which are adjacent one another. I brushed my teeth and climbed into bed. It’s now nearly 1:00 am and I’m wide awake, so I’ll take some melatonin and try to fall back to sleep. 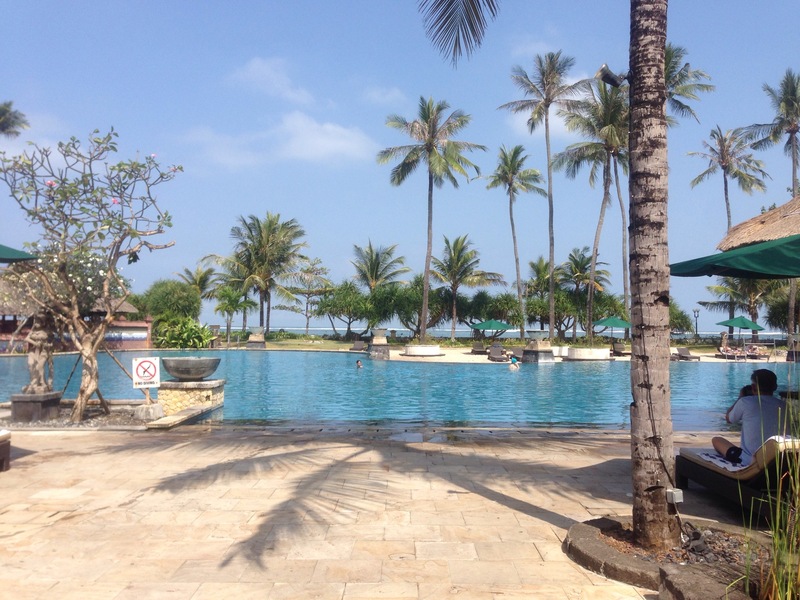 I didn’t think much about taking pictures of the crowds at the various airports but I will be more conscientious today – the resort grounds are lovely, right on Kuta Beach. 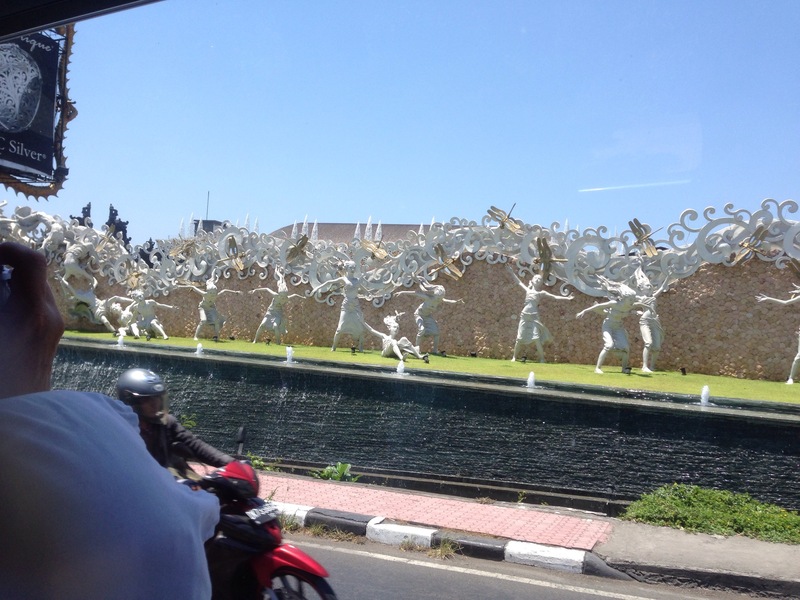 And we’re scheduled to spend the afternoon visiting a large shopping market in Denpasar in the afternoon. 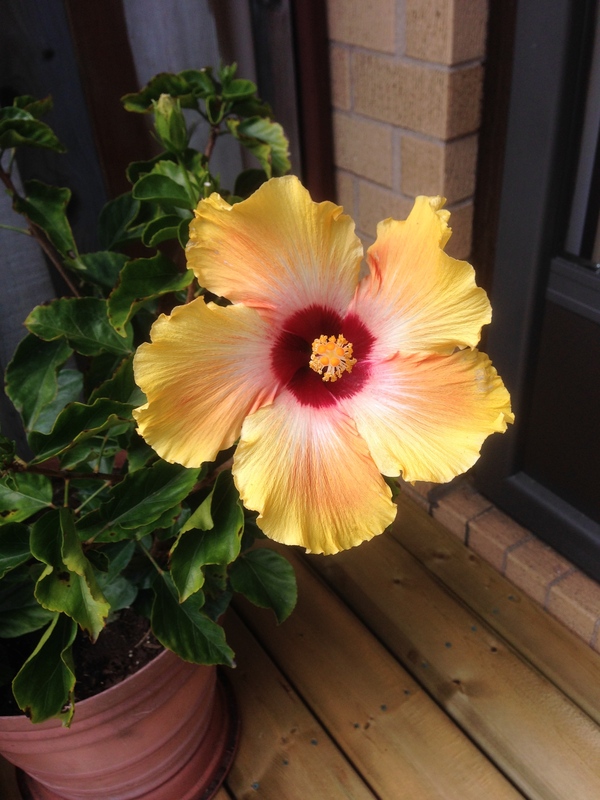 My hibiscus was slow to start blooming — I got a couple of flowers when I bought it earlier in the summer but then nothing for about a month. 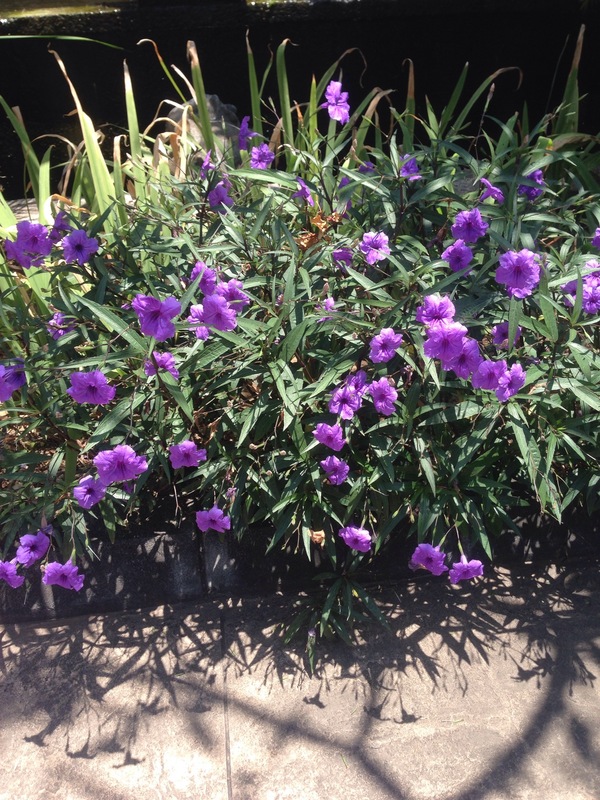 When the plant got moved back to the newly finished deck it decided it liked its new home, I guess, and started blooming – a couple of flowers a day. Most of them have had a yellow edge to the petals with predominantly red centers – this one turned out to be predominantly golden yellow. I think I’ve caught it at its peak. The flower didn’t survive the storm we had yesterday – good thing I to the picture when I did. You’d never guess that two weeks ago these socks had holes in the heels the size of loonies ($1 CDN coin). 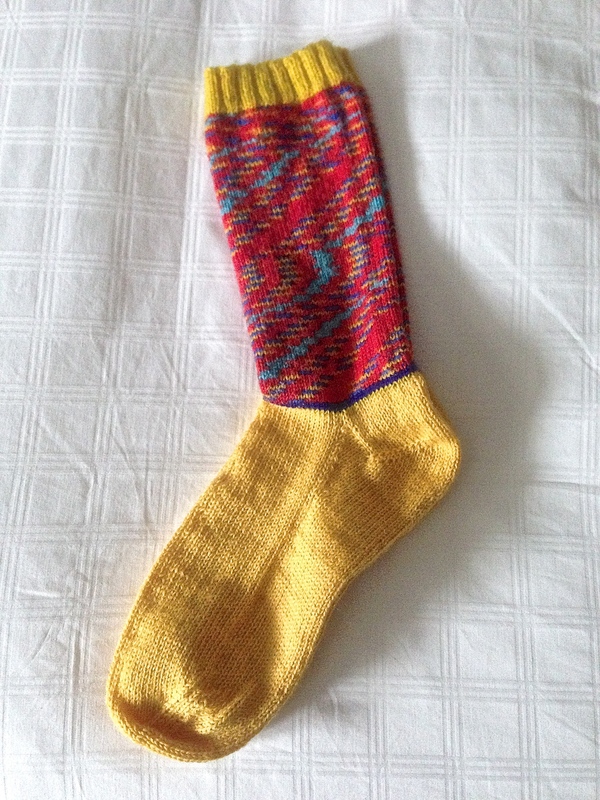 I don’t do this for everybody – if I did I’d never get to knit new socks but it was a shame to throw these socks in the garbage with salvageable legs. The holes were too big to darn and the surrounding heel was weakened too much to just replace the heel so I cut off the feet at the blue line and reknit new feet! I figure I’ve saved myself half the work of a complete pair of socks!